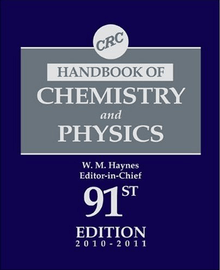 The CRC Handbook of Chemistry and Physics is a comprehensive one-volume reference resource for science research, currently in its 97th edition (ISBN 1-4987-5428-7 with 2670 pages, June 24, 2016, Editor-in-Chief William M. Haynes.) It is sometimes nicknamed the 'Rubber Bible' or the 'Rubber Book', as CRC originally stood for "Chemical Rubber Company". As late as the 1962–1963 edition (3,604 pages) the Handbook contained myriad information for every branch of science and engineering. 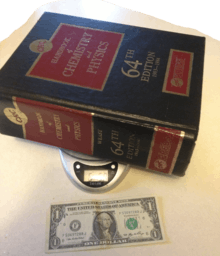 Sections in that edition include: Mathematics, Properties and Physical Constants, Chemical Tables, Properties of Matter, Heat, Hygrometric and Barometric Tables, Sound, Quantities and Units, and Miscellaneous. There are such prosaic subjects as "Antidotes of Poisons", "Rules for Naming Organic Compounds", "Surface Tension of Fused Salts", "Percent Composition of Anti-Freeze Solutions", "Spark-gap Voltages", "Greek Alphabet", "Musical Scales", "Pigments and Dyes", "Comparison of Tons and Pounds", "Twist Drill and Steel Wire Gauges" and "Properties of the Earth's Atmosphere at Elevations up to 160 Kilometers". Later editions focus almost exclusively on Chemistry and Physics topics and eliminated much of the more "common" information. In addition to an extensive line of engineering handbooks and references and textbooks across virtually all scientific disciplines, CRC is today also known as a leading publisher of books related to forensic sciences, forensic pathology, criminology, and police sciences. PDF copy of the 8th edition, published in 1920.